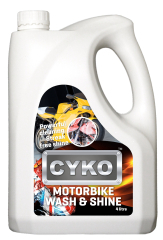 CYKO™ Motorbike Wash & Shine works equally well on wheels and glass, chrome and paintwork, our formula makes cleaning your bike like a walk in the park. 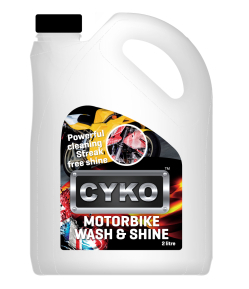 CYKO™ Motorbike Wash & Shine is tough on grime and the causes of grime, yet gentle on the environment & completely biodegradable. CYKO™ products are not tested on animals because that would be cruel and CYKO™ is anything but cruel. Besides, whoever heard of a shiny rabbit? !